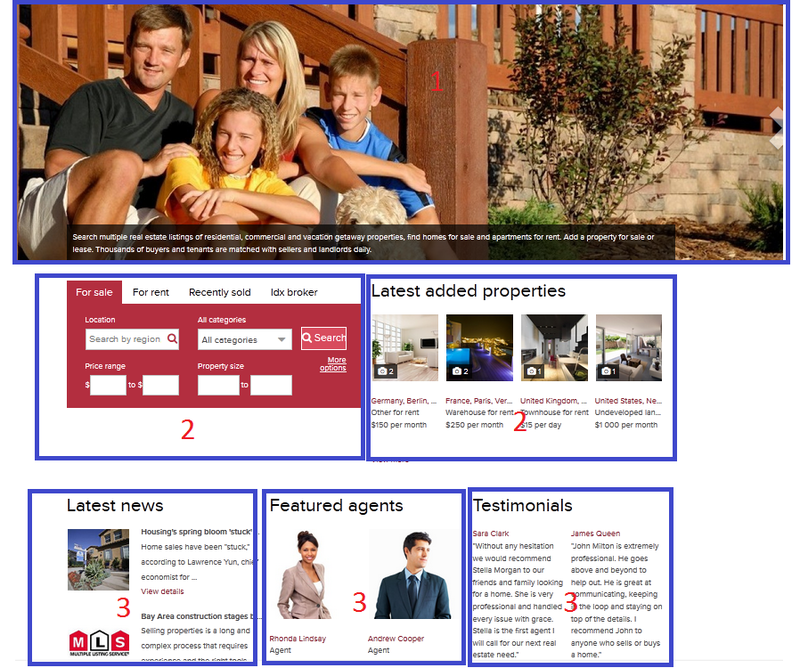 Dynamic blocks are sections on your site front page with dynamically updated content (listings, agents, categories. etc.). You can edit the way these sections and information are displayed. 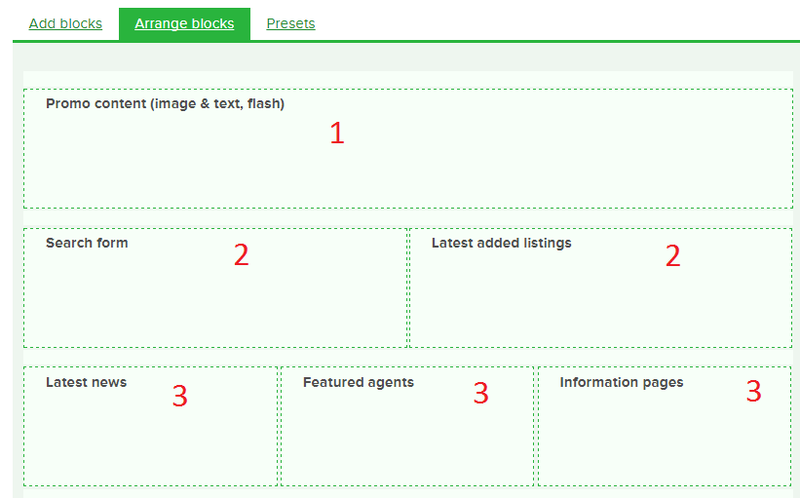 You can manage dynamic blocks in Administration panel > Interface > Dynamic blocks. Click settings icon to get to dynamic blocks management. Add blocks stands for adding and removing dynamic blocks. From dropdown list select the necessary block and add it. Every dynamic block has specific settings, e.g. 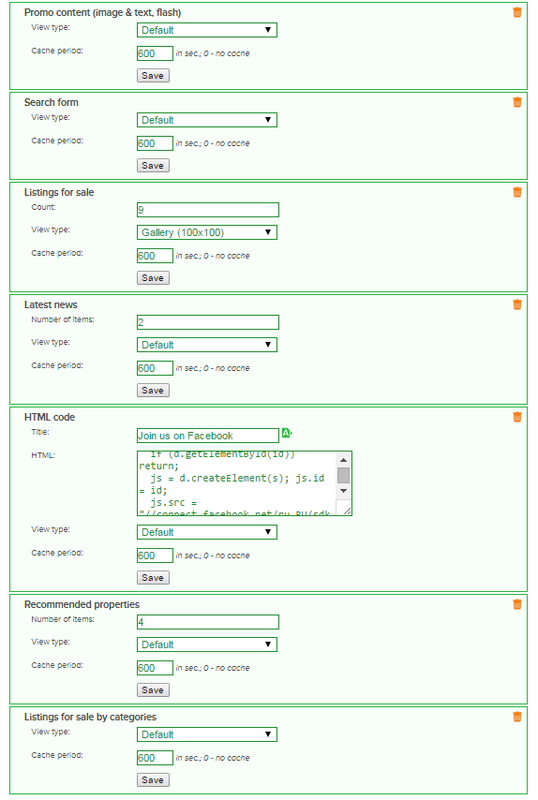 view type, count, cache period, keyword, number of items. 1. 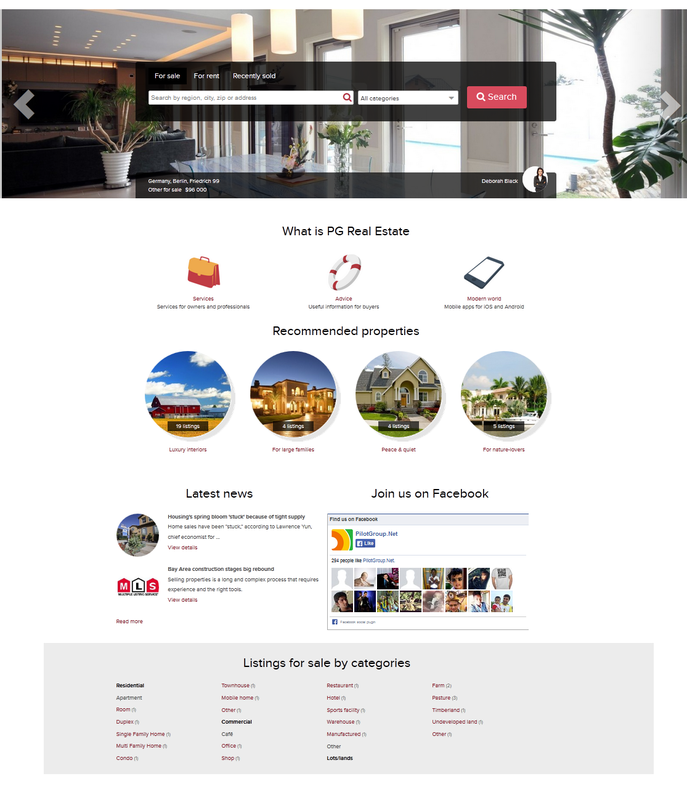 For block Slider with listings & search form, make sure that the size of the first picture in your listings corresponds to the image’s size in this dynamic block or more. 2. Upload images, videos, texts for Promo content dynamic block in Interface>Promo block. 3. 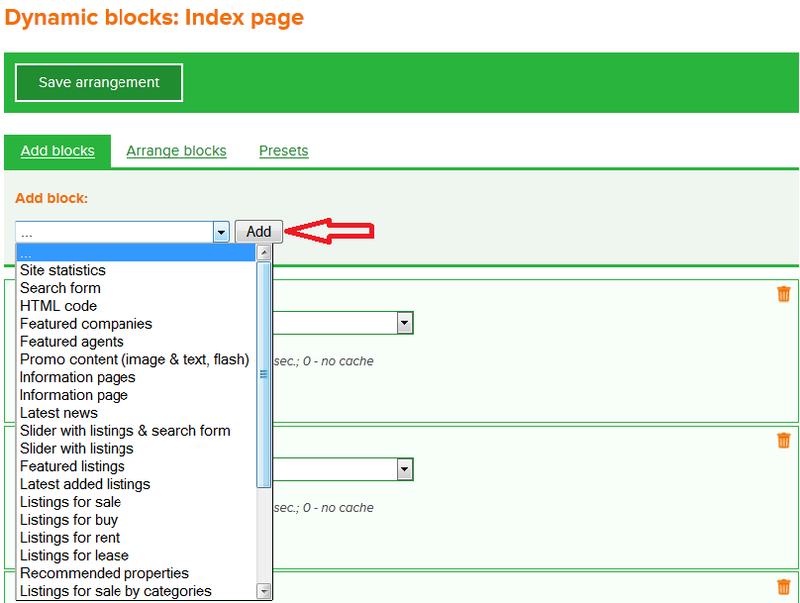 In Information page block write a keyword of the necessary info page. You can check keywords for every page in Content>Info pages. To view a keyword, click a pencil icon. 4. 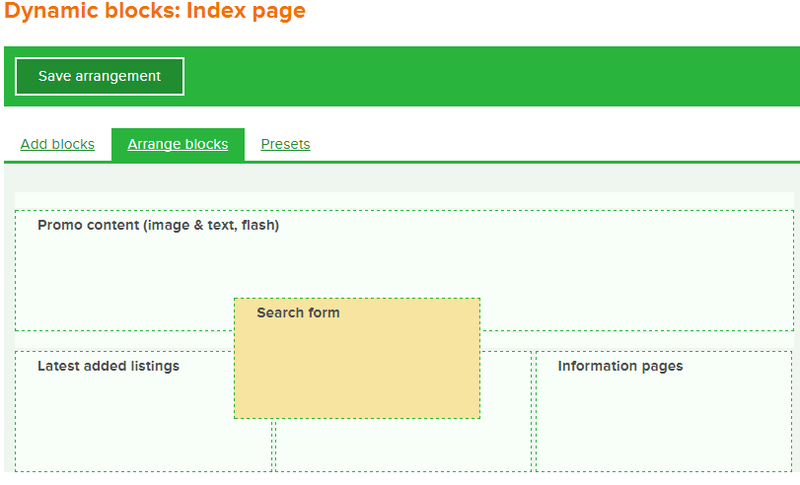 Information pages block allows you to add some root info pages or sub-pages to the main page site at once. To add root info pages leave a «keyword» field empty. 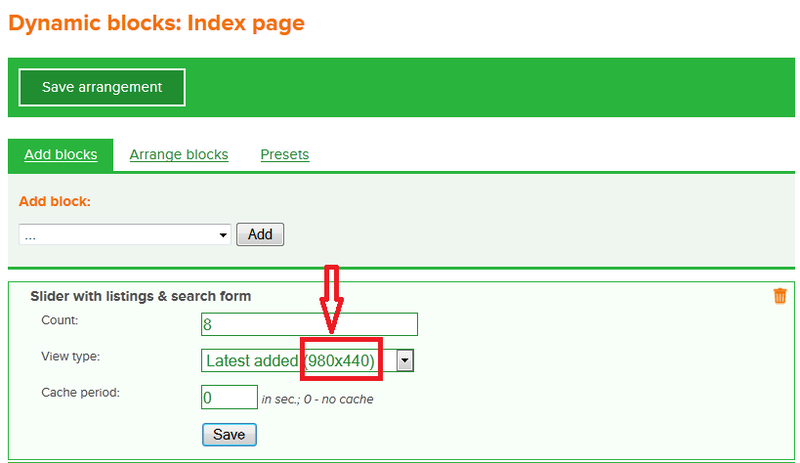 To add sub-pages write a keyword of the appropriate root info page. 5. Avoid,,tags in ‘HTML code’ block. 6. Cache period is used to improve site performance, as saved elements do not have to generate a new one every time you load a page. That is why if you make some changes in Dynamic blocks section and do not see them applied on your landing page immediately, check if you indicated cache period other than ‘0’. 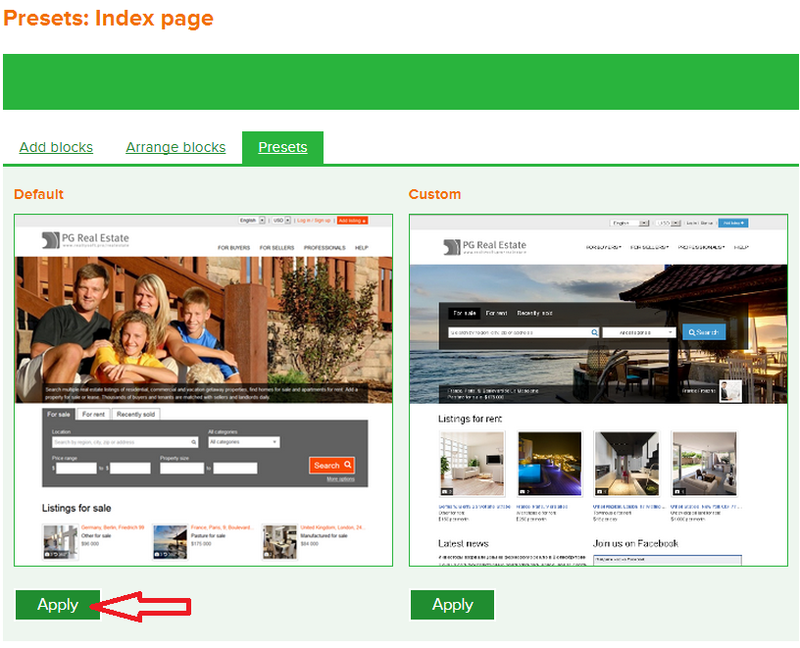 Arrange blocks section is for changing the order of dynamic blocks on the main site page. It is possible to add maximum three blocks in a line. Every block can have three sizes. Drag and drop blocks to alter their sequence. To save the changes press “Save arrangement” button. Presets section is used for applying dynamic blocks of any bundles to the activated theme. To do that press “Apply” button. These dynamic blocks will be applied to user mode too.